Meet Daisy Lily! This adorable, soft plush doll is waiting just for you. Dressed in her favorite color pink including a polka dot skirt, top and soft bow headband. And, don't forget her removable Daisy vest. With black yarn hair and fully embroidered face. 15” tall. Polyester velour. Imported. Daisy Kiara, Ava and Mia sold separately. Collect all 4! Her name is Kiara and she's "pretty in pink". With adorable skirt and top and soft, pink hair bows. And don't forget her removable Daisy tunic! With black yarn hair and fully embroidered face. 15" tall. Polyester velour. Imported. Daisy Lily, Ava and Mia sold separately. Collect all 4! 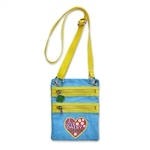 Double zipper bag designed just for Daisies. 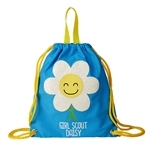 Double zipper bag designed just for Daisies. 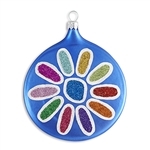 Daisy flowers make these pencils colorful and cute! Three styles of pencils feature "Girl Scout Daisy" with blue, green, turquoise background. Price listed is for one pencil. Assorted, we'll select. Imported. Daisies, get happy—Write away! 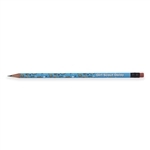 Blue pencil with upbeat, multi-color, character imprint including trefoils, bumblebees and hearts. “Girl Scout Daisy” on barrel at eraser end. Imported.